Copy css and js directory from src directory into your web application directory. Include jscal2.js, en.js (your prefered language), jscal2.css, border-radius.css and your prefered theme css file (eg: win2k.css) in the HEAD section of your HTML file. Line 01: Container to display calendar. Line 02: Text field to display selection date. Line 07: The container id. Line 08: Will display time selector if set to true and vice versa. Default value is false. Line 09: Callback function that will be called when selection changes. Line 01: Text field to display selection date. Line 02: Trigger button to display popup calendar. Line 06: Trigger button id. Line 07: Text field id. There are two simple ways to disable dates, by using min and max arguments in the constructor or by using disabled() callback function. 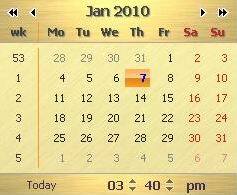 Line 3: The minimum (oldest) date that the calendar allows for selection. Line 1: Disabled dates definition. Line 4: Callback function to disable dates. Line 01-04: Highlighted date and tooltip definitions. set highlight CSS class in klass parameter and tooltip message in tooltip parameter. Line 08: Callback function to display highlighted dates and tooltip. Hi, how can i change the language of the calendar in the Calendar.setup ? i want to show the calendar in Spanish. How can we show 3 months together at a time ?